Attorney General William Barr says memo on Mueller investigation was entirely proper. This week, U.S. Attorney General William Barr, a Republican, announced that his predecessor, Jeff Sessions, just hadn't gone far enough when he asked a federal judge to kill the Affordable Care Act's (ACA) protections for people with pre-existing medical conditions -- that is, stuff like asthma, diabetes and high blood pressure. Barr told an appeals court that he does not want it to merely murder that one provision but, instead, will insist that it massacre the ACA's entire 1,990 pages -- death to every clause protecting patients from insurance company abuses, every portion devoted to containing costs, every phrase extending health care to the nation's young adults and working poor. 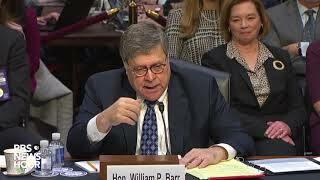 It is essential, Barr contends, that the court rip insurance from 21 million people -- covered by the ACA health insurance marketplaces and Medicaid expansion; that the court deny insurance to 2 million young adults covered by their parents' plans; that the court foreclose substance abuse treatment to 800,000 Americans -- suffering opioid addiction. It is critical, Barr insists, to deprive the ACA's guarantee of medical insurance access to 133 million Americans with pre-existing conditions and to increase medication and premium costs for 60 million senior citizens on Medicare. Also, of course, Barr says, the court must restore the medical insurance caps that bankrupted and killed Americans who suffered diseases that are expensive to treat, like cancer, or whose babies were born prematurely requiring costly long-term care. All of this is blatantly mean-spirited because the GOP never produced a plan to replace the ACA health insurance guarantees. In medical terms, it is the opposite of the physician mission to heal. It is Republican machination to harm. People who drive a Mercedes, spend half a million bucks to get their children into high-status universities and lull away weekends at $3 million Nantucket beach homes will always have health care. The price is irrelevant to them. Even if denied insurance, they can afford chemotherapy, or the monthly bill for insulin or the cost of a leg broken in a sail-boating accident. For everyone else, for coal miners and code writers, for registered nurses and Starbucks baristas, for Amazon warehouse workers and independent truck drivers, health insurance is vital. Workers, whether low-income or middle class, don't have hundreds of thousands sitting around for a heart transplant or repeated cancer treatments or neonatal care. Before the ACA, health insurance corporations took advantage of this situation. They raised premiums at twice the rate of inflation. They refused to insure sick people -- the people who desperately need insurance, people with inherited conditions and chronic illnesses. Even some employer-based insurance plans excluded coverage for certain medical conditions. Insurers dropped coverage when people got sick. They capped coverage -- so that if $1 million or $2 million -- or some other random amount -- was spent to save the preemie's life in the first 18 months, the still-fragile baby was uninsured after that. Uninsured people died of treatable conditions because they couldn't afford care. Inadequate insurance bankrupted families. Americans worried incessantly about whether they would be able to afford to maintain their insurance or whether an illness would cost them their coverage. The ACA cured many of these problems in addition to lowering the rate at which the cost of health insurance rose. As it accomplished those things, it became more popular. Its approval rating rose from around 40 percent initially to 51 percent now. That's not great, but it sure as hell is better than the way people felt about insurance before the ACA. The position of Republicans, however, is that some people just don't deserve health insurance. It's similar to saying some children just don't deserve an education. Or some families just don't deserve to have a fire department respond to a blaze at their home. Republicans' first effort to thwart the ACA was a lawsuit challenging its constitutionality. The U.S. Supreme Court ruled that most of the law complied -- but that the federal government could not force states to expand Medicaid. Under the ACA, the federal government initially paid 100 percent, and later 90 percent, of what it cost states to extend Medicaid coverage to people who earned up to 138 percent of the federal poverty threshold, which is about $17,000 for an individual or $35,000 for a family of four. As a result, Republican governors and lawmakers denied Medicaid to millions of eligible low-income working people and their families. Some Republican governors went so far as to defy the will of the people of their states. In Maine, for example, voters approved expanding Medicaid in 2017 in a binding referendum by 59-to-41 percent after the Republican governor five times vetoed Medicaid expansion proposals. Even after the referendum and a court decision ordering expansion, the Republican governor refused to do it. Not until a Democrat took the governor's seat this year did it happen. Similarly, Virginia and Kansas got Medicaid extensions only after they elected Democratic governors. Single payer needed.Insurance companies are ruinously expensive middlemen. Careful. Single payer is one large middleman.